1 - Monkey 47 Schwarzwald Dry Gin: In addition to the funky monkey stamp, this gin from Germany’s Black Forest manages to blend 47 unique botanicals (from lingonberries, blackberries, and honey pomelo to chamomile, sage, angelica, coriander and more.) 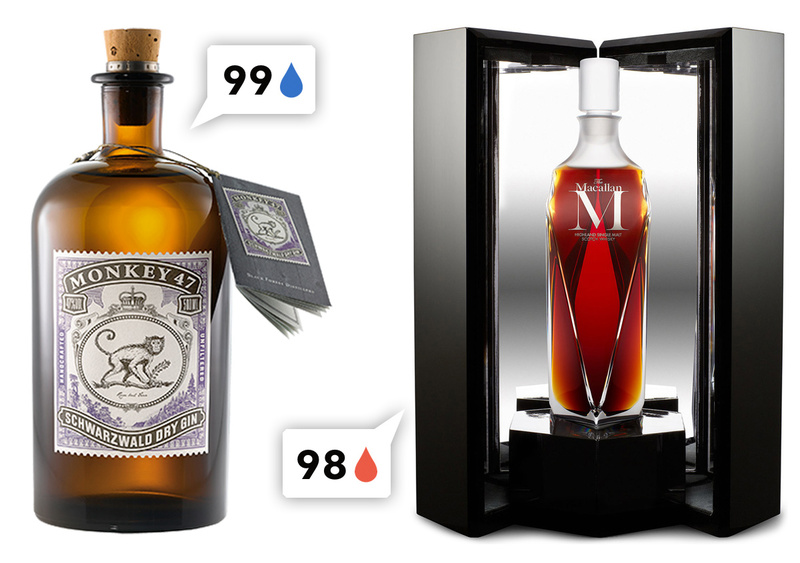 See the Distiller Review for Monkey 47 Schwarzwald Dry Gin. 2 - The Macallan M: Wow. Look at this stunning, faceted 6 liter Lalique decanter! Packaged in a mirrored presentation box no less. And what it holds is the “most expensive whisky sold at auction” that Distiller’s reviewer describes as having “The aroma is that pleasing bouquet that comes from a small book store with oak shelves filled with rare first editions.” I’ve always had a soft spot for a Macallan sherry cask scotches, and can only imagine how delicious this one must be! 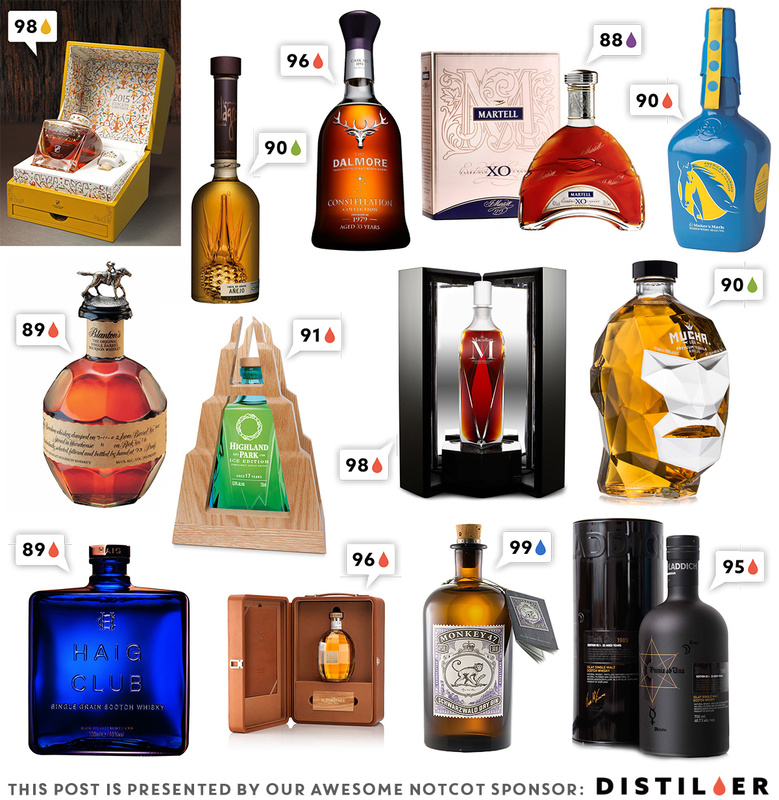 See the Distiller Review for The Macallan M.
3 - Brugal Papa Andres 2015 Alegria Edition Rum: Crystal decanter with colorful flourishes, in a vibrant yellow presentation box and illustrated collector’s book all designed by Spanish designer Javier Mariscal. Only 1000 bottles of this special edition were produced. See the Distiller Review for Brugal Papa Andres 2015 Alegria Edition Rum. 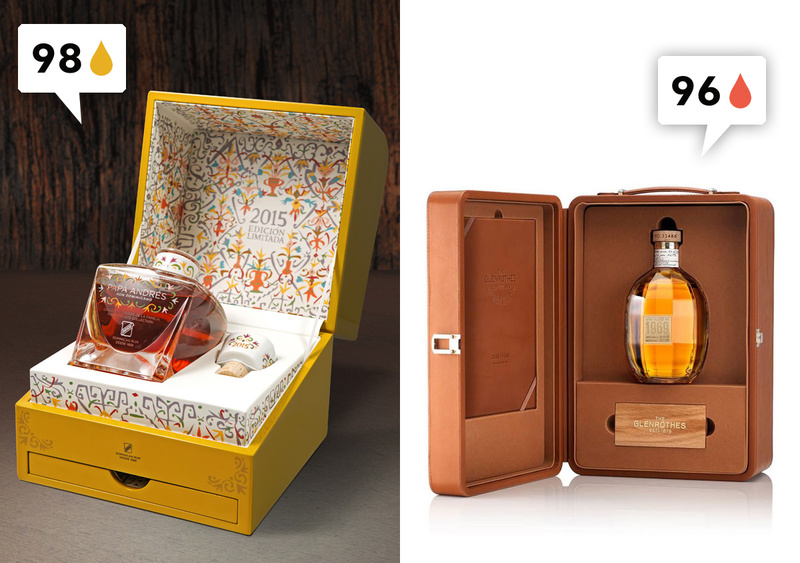 4 - The Glenrothes Extraordinary Single Cask 1969: What a beautiful leather case, with booklet and what appears to be a wooden drawer? And that special edition bottle! See the Distiller Review for The Glenrothes Extraordinary Single Cask 1969. 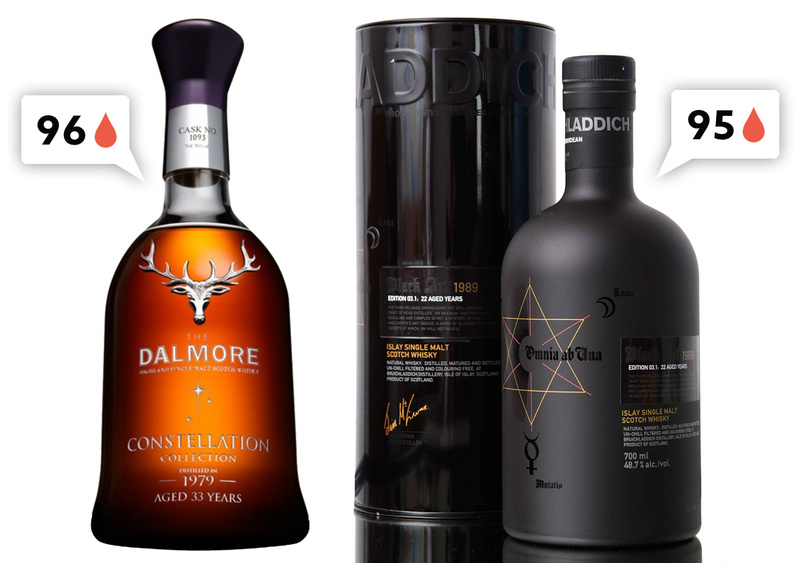 5 - Dalmore Constellation 1979 Cask 1093 33 Year: Bottled in a hand blown decanter, adorned with a solid silver stag and presented in a lacquered box. See the Distiller Review for Dalmore Constellation 1979 Cask 1093 33 Year. 6 - Bruichladdich Black Art 4 1990: The matte black bottle… the glossy tin… the colored star… and that iconic minimal bottle shape. Its beautiful! See the Distiller Review for Bruichladdich Black Art 4 1990. 7 - Highland Park Ice Edition: Highland Park always has such fun framing their unique limited edition bottles in woody magnetic display cases, and the Ice Edition is no exception. See the Distiller Review for Highland Park Ice Edition. 8 - Maker’s Mark American Pharoah: The blue! 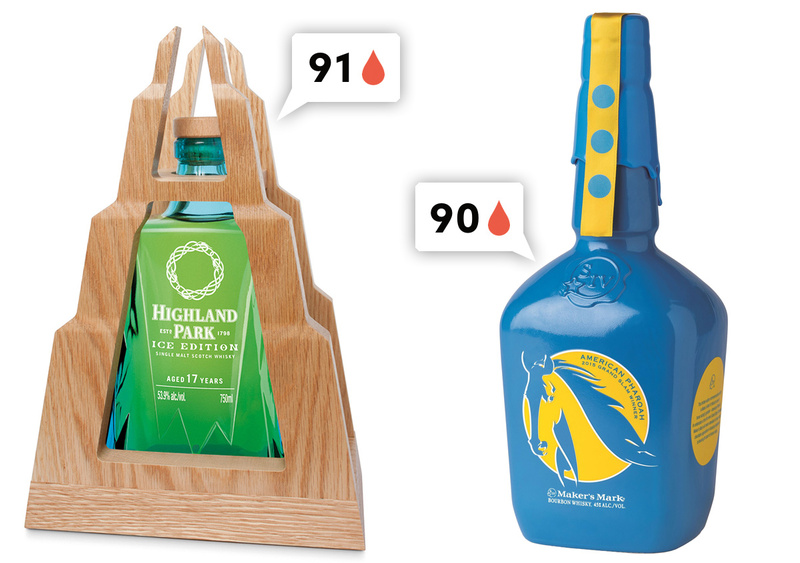 From blue bottle to blue wax seal and popping yellow details, this is a fun one dedicated to the Triple Crown winner. See the Distiller Review for Maker’s Mark American Pharoah. 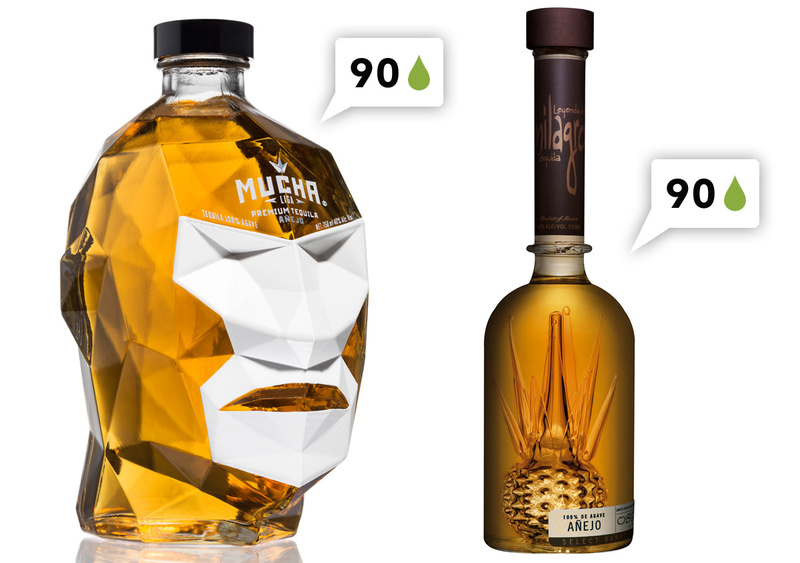 9 - Mucha Liga Invicto Anejo Tequila: The faceted masked Mexican wrestler head bottles of Mucha Liga are fantastic. (See the NOTCOT feature on Mucha Liga packaging.) See the Distiller Review for Mucha Liga Invicto Anejo Tequila. 10 - Milagro Select Barrel Reserve Anejo Tequila: The bottle! Milagro always has such stunning hand-blown glass bottles with agave plants bursting into the base. they are mesmerizingly beautiful! See the Distiller Review for Milagro Select Barrel Reserve Anejo Tequila. 11 - Blanton’s Original Single Barrel: From the faceted grenade like bottle shape to the intricate stopper, and the flourish filled text… this bottles makes you look closer. According to Distiller, “Insider’s note: Save the stoppers. They spell out Blanton’s and depict eight different moments from the beginning to end of a horse race.” See the Distiller Review for Blanton’s Original Single Barrel. 12 - Haig Club Single Grain: At first glance, this bright blue glass bottle is more reminiscent of a large perfume bottle than a whisky. Reading the Distiller reviewer’s tasting notes, it sounds like this one tastes like BREAKFAST! “Breakfast cereal with a dollop of honey and vanilla are the first things you’ll smell with this whisky. Brown butter and dried herbs join these aromas on the mid-palate. Buttery pastries and toffee are present with a toasted barrel profile. The spice factor is on the low end and the finish is soft with a slight tang to prepare you for another sip. 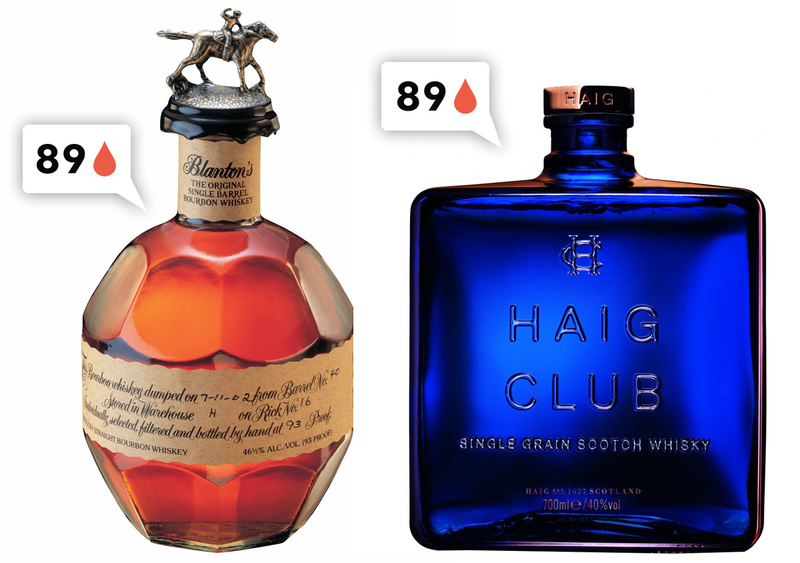 ” See the Distiller Review for Haig Club Single Grain. 13 - Martell XO Cognac: The M on the presentation box and neck of the bottles, the bird flying across the glass bottle, and that arch! This cognac XO incorporates eaux-de-vie that is 10-35 years of age, all powered by Grand Champagne region grapes, and backed up by Borderies grapes. It sounds like a spicy, fruity delight. 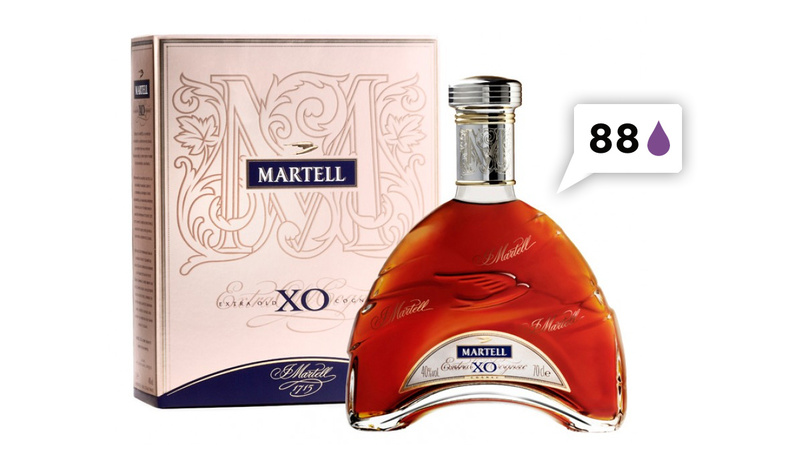 See the Distiller Review for Martell XO Cognac.